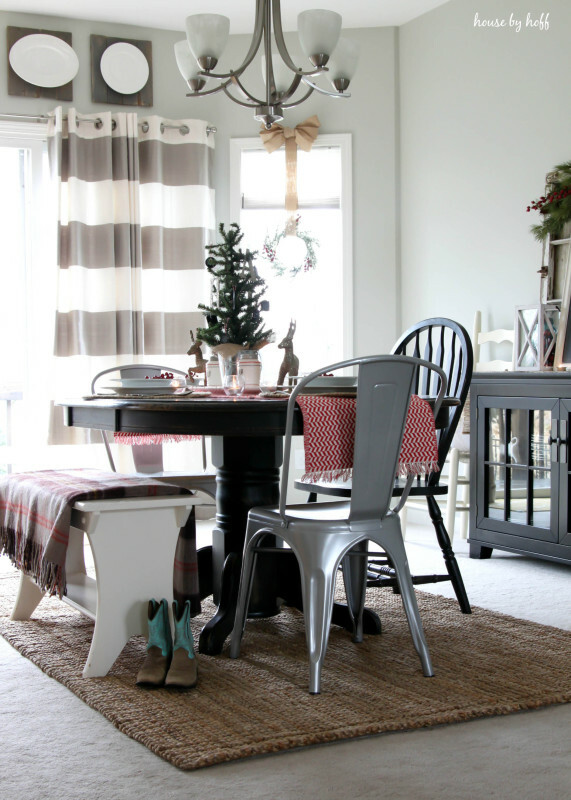 Today I’m sharing my holiday dining area and kitchen in Part 1 of my holiday home tour! A big thanks to Carrie, from Lovely Etc. 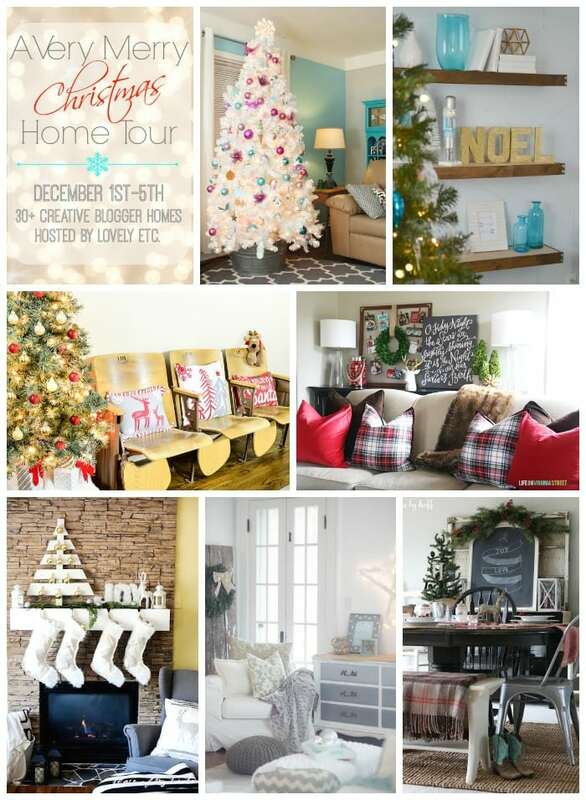 for inviting me to take part in the “A Very Merry Christmas Home Tour” this year! My “eating area”, as I call it, is an evolving space in our home. I’ve recently added a jute rug and some industrial chairs, and I love the character these items have brought to this area. 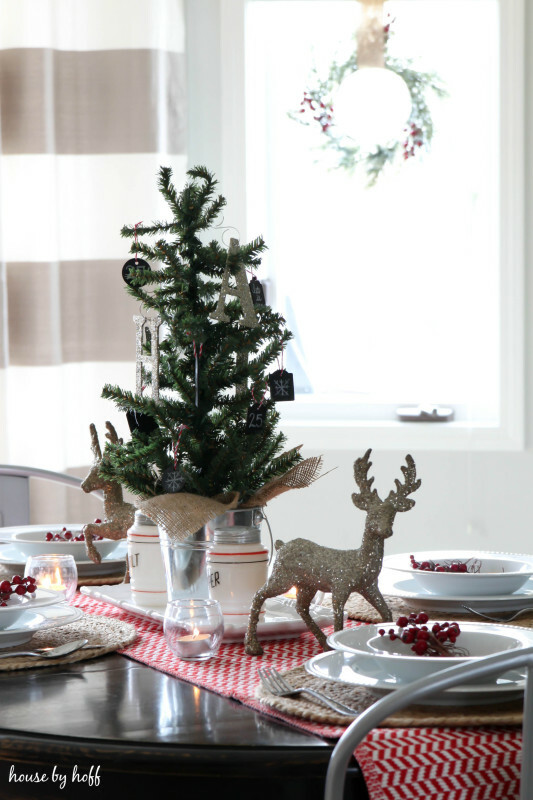 Decorating the tabletop is always so much fun! 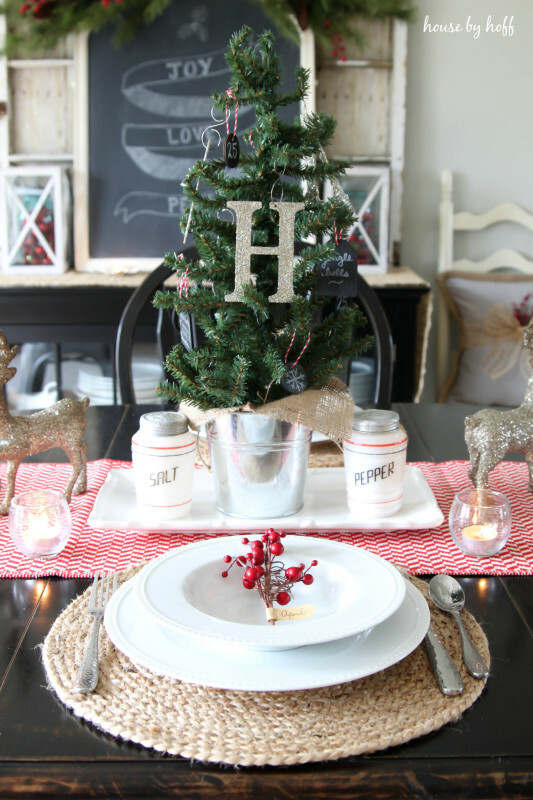 I grabbed a lot of new accessories, including the table runner and the little faux Christmas tree, at Target this year to create an eclectic holiday table. 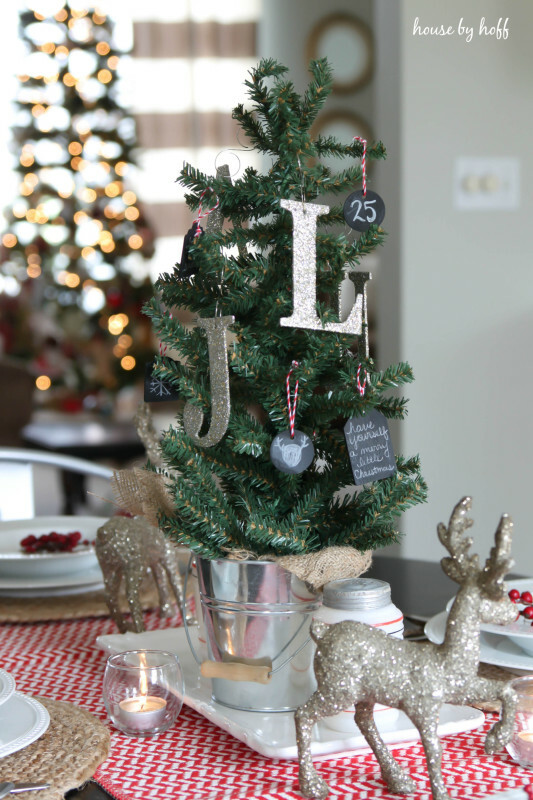 Using sparkly stocking charms to create a monogram Christmas tree with all of our initials makes this centerpiece personal and unique. I also made some chalkboard tag ornaments with fun holiday sketches and messages. 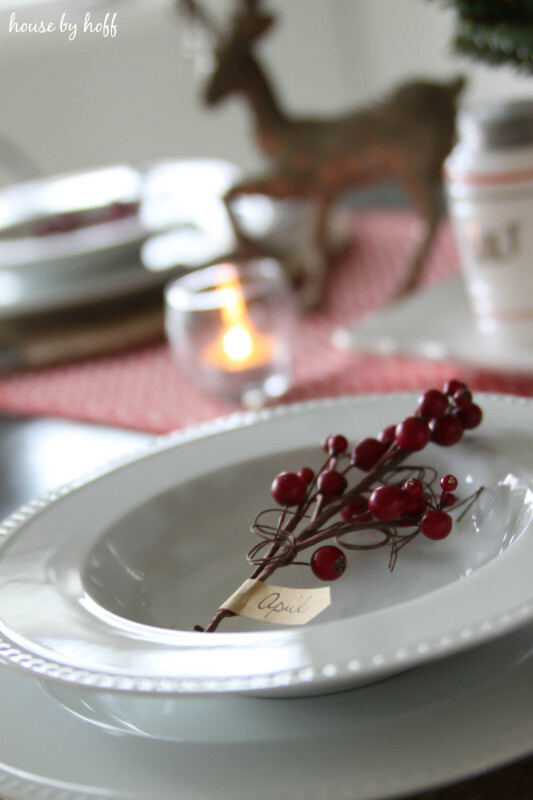 I wanted to be creative with the place settings, so I used a sprig of red berries labeled with each of our names. I like the pop of color and natural element that it adds to the table. If loving a sparkly reindeer is wrong, then I don’t want to be right. 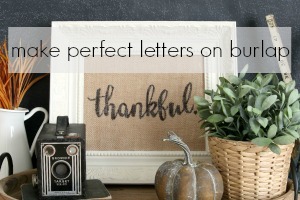 You’ll find these everywhere in my holiday decor this year! In a last minute move, I switched it up in our eating area by moving a bench from the foot of our bed to the dinging room table. I am in love with the seating in this space right now. I love a perfectly put together “mishmash” of seating…does that even make sense?? Our kitchen is looking festive and holiday-ready too! 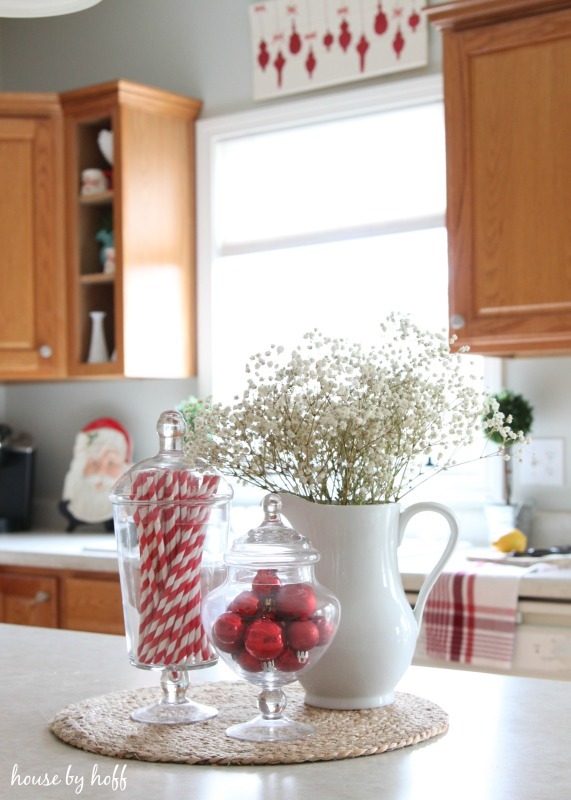 Vintage Santa accessories mixed with some pops of red make the kitchen bright and cheerful. 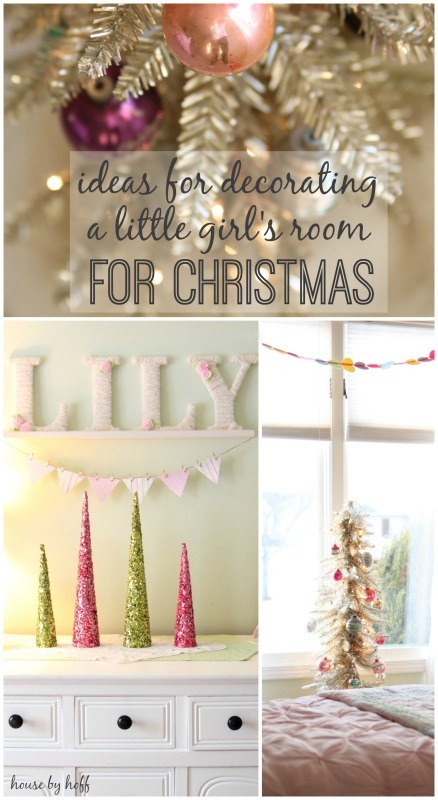 To see my daughter’s room all decked out for Christmas, click here. Don’t stop here! 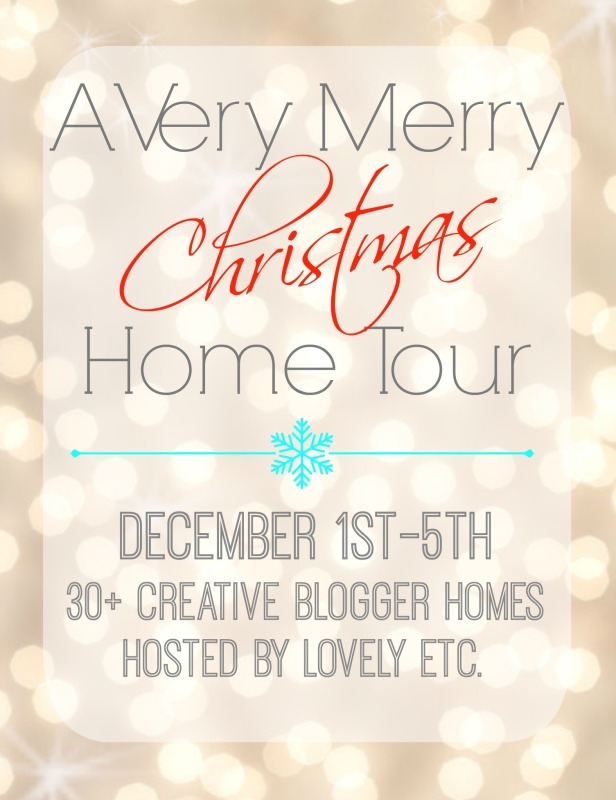 There are lots of home tours going on in the “A Very Merry Christmas Home Tour” today! Check out the awesome homes below! April, you have such a welcoming and beautiful home! Thanks so much for sharing your Christmas tour. Beautiful April! 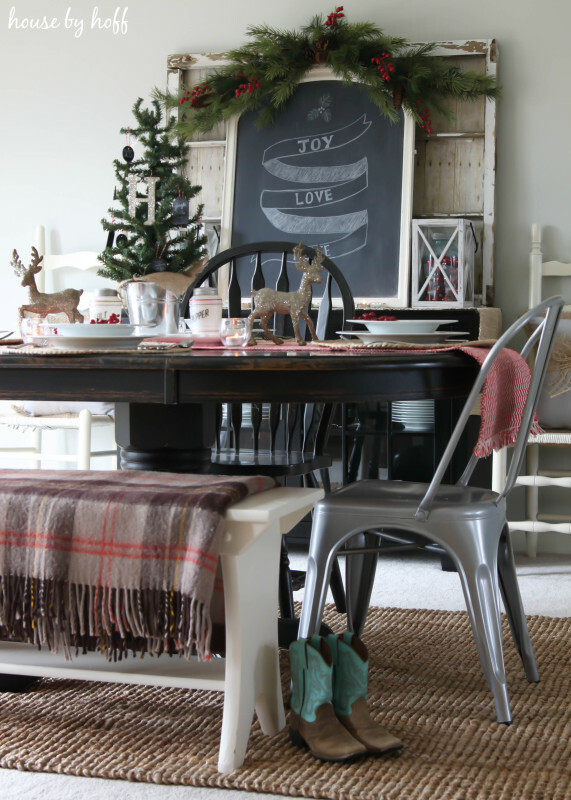 I love the chairs and bench at your dining table- such a fun mix! Thank you, Krista! I love the mix too! So pretty! What a welcoming home all decked out for the holidays! I love what you’ve done! How did I miss that you were a reading teacher!?! 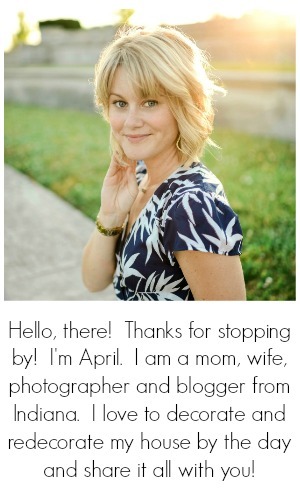 I teach, too, full time and it’s so nice to know someone else juggles it all! You do it so so well! Your home is beautiful! Wow! We have a lot in common, Amber! It’s a balancing act for sure!! Your eating area is absolutely PERFECT! Really….it’s perfection! 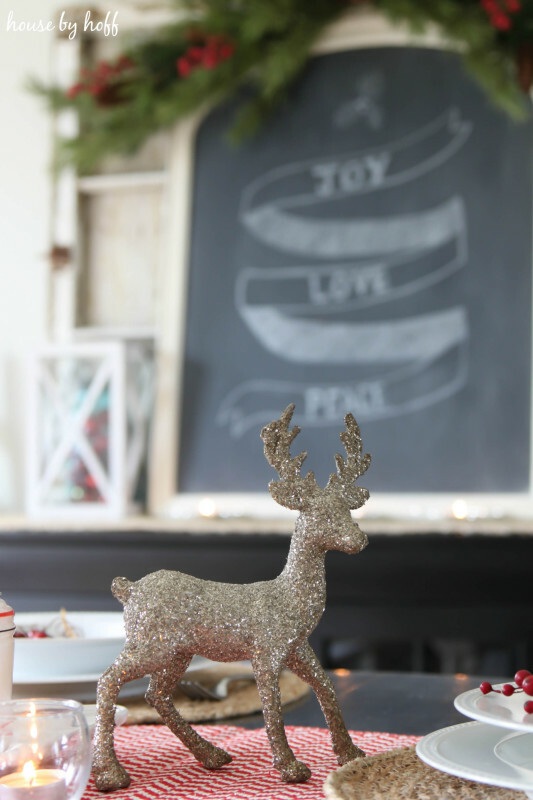 The table runner is amazing and I’m also obsessed with sparkly deer. Thank you, Melissa! You made my day! Just love your tour… so classic in colors and perfectly perfectly displayed! I always love your decor. 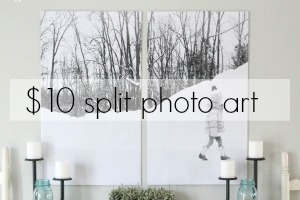 Your dining room is stunning and looks so inviting! I love it 🙂 Can’t wait to see the rest! Thank you, Alicia! You made my day! I love your dining room! I especially love the giant window in the background. Everything looks great!